Lithium. Known as the new oil. The next generation of power. 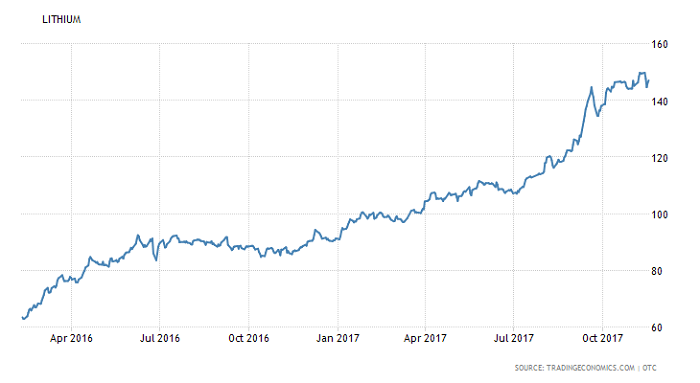 The price of lithium has shot up over 100% just this year alone. For explorers it's created a new type of gold rush trying to find a mineable deposit. But what is lithium and where does it really come from? Lithium is one of the lightest of all the metal elements known to man and it's being explored for the world over. Sith new lithium Ion battery technology some people say lithium will power the world and when it comes to things like laptops, tablets and other digital gadgets it definately is powering the world. Lithium compounds, also known as lithium salts, are primarily used as a psychiatric medication. This includes the treatment of major depressive disorder that does not improve following the use of other antidepressants, and bipolar disorder. Lithium is a chemical element with symbol Li and atomic number 3. It is a soft, silvery-white alkali metal. Under standard conditions, it is the lightest metal and the lightest solid element. Like all alkali metals, lithium is highly reactive and flammable, and is stored in mineral oil. When cut open, it exhibits a metallic luster, but moist air corrodes it quickly to a dull silvery gray, then black tarnish. It never occurs freely in nature, but only in (usually ionic) compounds, such as pegmatitic minerals which were once the main source of lithium. Due to its solubility as an ion, it is present in ocean water and is commonly obtained from brines. Lithium metal is isolated electrolytically from a mixture of lithium chloride and potassium chloride. When it comes to mining or extraction of lithium the most efficient methods of course is extraction from lithium brines or salts. 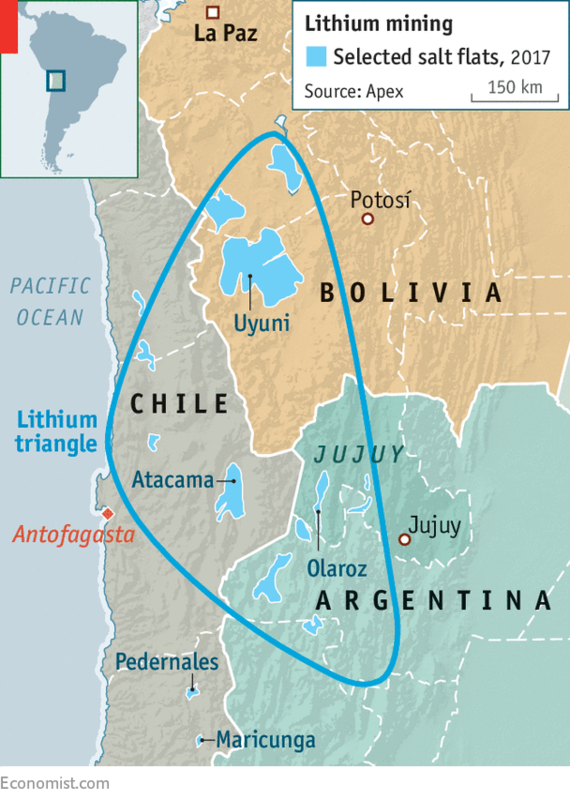 Lithium is found in all parts of the world and is found in hard rocks in Australia, clays and muds in Nevada but nowhere in the world is this more abundant and productive than in the so called lithium triangle of South America. Known as the great Salar the Slar flats in Boliva cover over 100,000 square KM. Thats an area that is larger than a lot of European countries. For a long time, most of the world's lithium was produced by three producers often referred to as the Big 3. 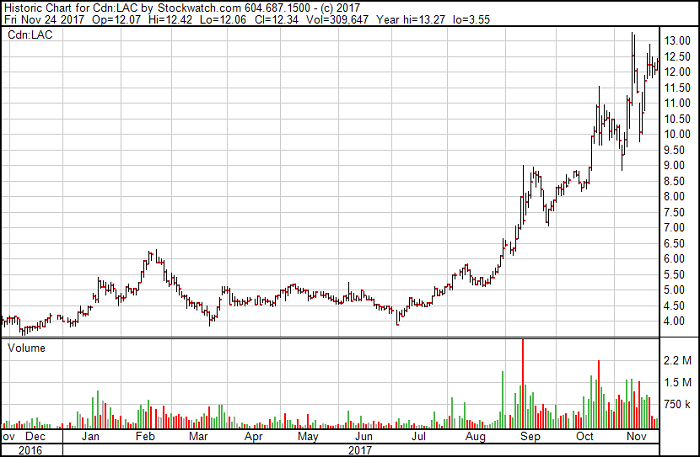 Before being acquired by Albemarle (NYSE:ALB), Rockwood Lithium, part of Rockwood Holdings, was on that list. The other members of the club were Chile's Sociedad Quimica y Minera de Chile (NYSE:SQM) and FMC (NYSE:FMC), which operates in Argentina. Today however there are dozen of junior mining companies that are on the hunt for lithium deposits but there are very few that are actually extracting lithium at this present time. Most of the lithium that is produced at present comes from the companies that are in the lithium triangle right now. Some of the other companies in the triangle today that are both exploring and producing lithium are Lithium Americas LAC and Orocobre ORL. Lithium Americas through a Joint Venture with Sociedad Quimica y Minera de Chile SQM, is developing the Cauchari-Olaroz brine deposit in Jujuy in Argentina. Through its wholly-owned subsidiary, Lithium Nevada Corp. the company is developing one of North Americas largest lithium deposits in northern Nevada. Lithium Americas just finished a 5:1 roll back on stock and has applied for an NYSE listing. Orocobre is in partnership with Toyota and is now operating the world's first commercial, brine-based lithium operation in Argentina. The Company also owns Borax Argentina S.A, a well-established boron chemical and mineral producer with extensive operations and a 50-year production history. A few other noteable lithium explorers are Lithium X LIX, Neo Lithium NLC and Nemaska Lithium NMX. Lithium X holds two projects in in the prolific lithium triangle as well as participating in the Clayton Valley in Nevada through its ownership interest in Pure Energy Minerals. Nemaska is a bit different as they are developing lithium hard rock deposits in Quebec instead of brines like the others. The concentrate produced at Nemaska Lithium's Whabouchi mine will be shipped to the company's lithium compounds processing plant to be built in Shawinigan, Que. This plant will transform spodumene concentrate into high purity lithium hydroxide and lithium carbonate. Neo Lithium has the 3Q Project is located in Catamarca Province, Argentina. The 3Q Project has one of the highest-grade lithium brine projects in the world, with a large salar and lithium brine lake covering more than 150 square KM and controls more 350 square KM in and around the complex. The 3Q Project is 100% owned by Neo Lithium. In Australia, Macarthur Minerals MMS is focused on identifying high-grade gold and lithium. Macarthur Minerals has significant gold, lithium and iron ore exploration interests in Australia and Nevada along with two iron ore projects in Western Australia.